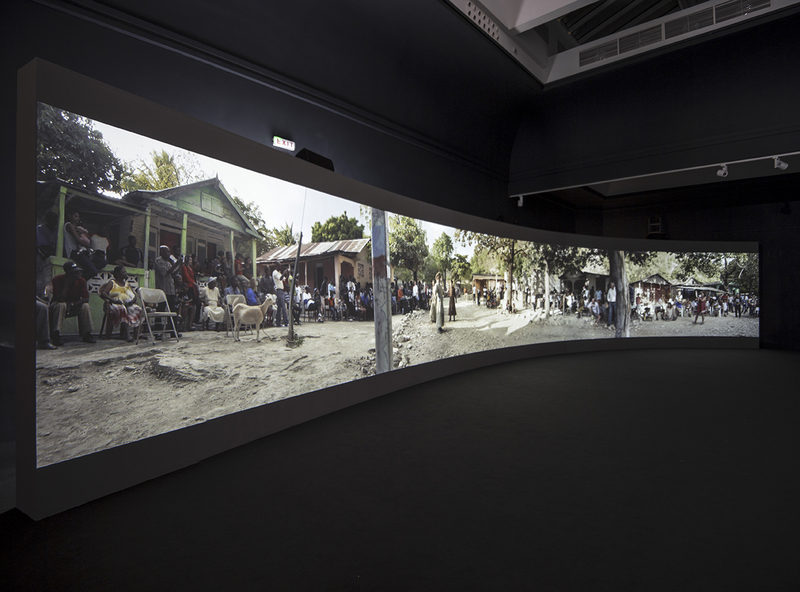 Installation view of Halka/Haiti 18°48’05”N 72°23’01,” Venice Biennale, Polish Pavilion, 2015. C.T. Jasper and Joanna Malinowska. This year, the little that I experienced of the Venice Biennale came through social and digital media. An intriguing post on my Facebook feed drew me to the project produced for the Polish pavilion. I searched for the project online and read about it on a few sites. There aren’t that many art projects of subtlety and complexity that travel and translate well through social media, but this project seems to be one, and it made me ponder why. Halka/Haiti 18°48’05”N 72°23’01.” Performance view. 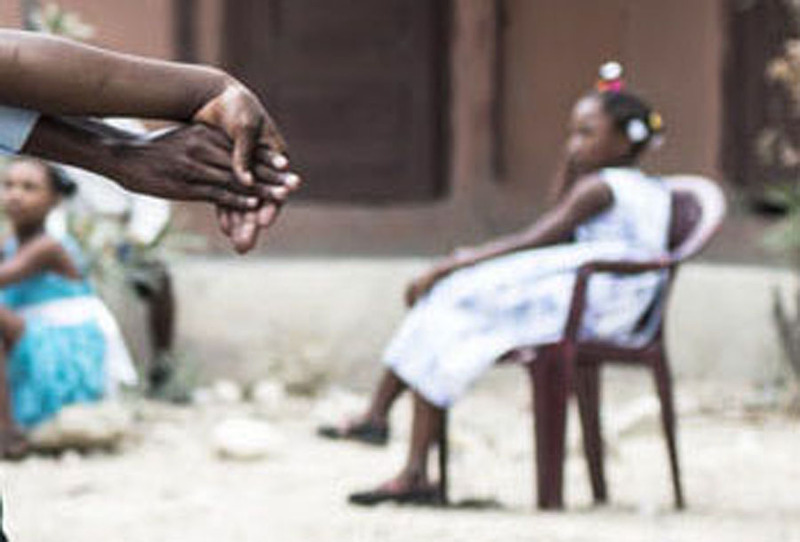 The project is Halka/Haiti 18°48’05”N 72°23’01,” by the artists C.T. Jasper and Joanna Malinowska, curated by Magdalena Moskalewicz. 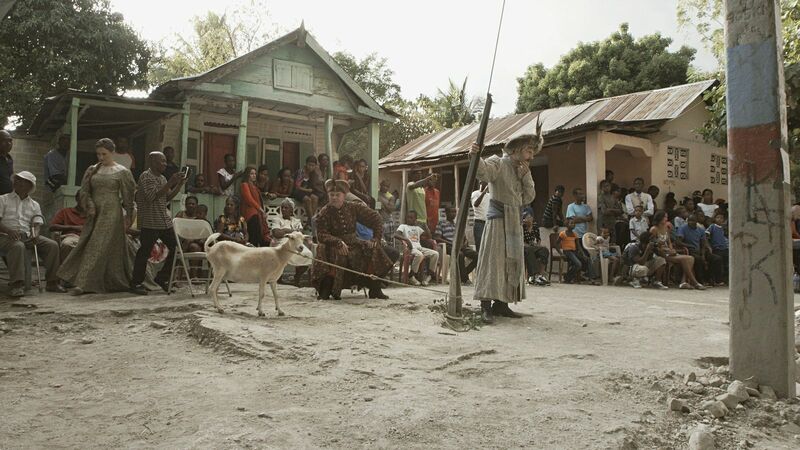 In brief, the project entails the recent staging by the artists of a production of an 1858 Polish “national” opera – Halka – in a village in Haiti in which reside descendants of the Polish soldiers who, brought by Napoleon to put down the anti-colonial rebellion in Haiti, are thought to have deserted Napoleon’s troops to fight alongside the Haitians who defeated the French in 1803. In the curator’s catalogue essay, Moskalewicz has written a fascinating account of the histories of the opera and its place in the Polish imagination, and of the histories and mythologies that have grown up around the possible role of the Polish soldiers in the revolutionary event in Haiti. The account is fascinating because of the subtle intricacies of Moskalewicz’s argument, which she develops as a backdrop to the work, but also because Moskalewicz chose to write very little about the project she selected to curate for the pavilion. Even in an official video, she doesn’t really explain the project to spectators. The table of contents in the catalogue for the exhibition indicates that there are interviews with the artists and some statements by the participants, as well as a few other historical texts. 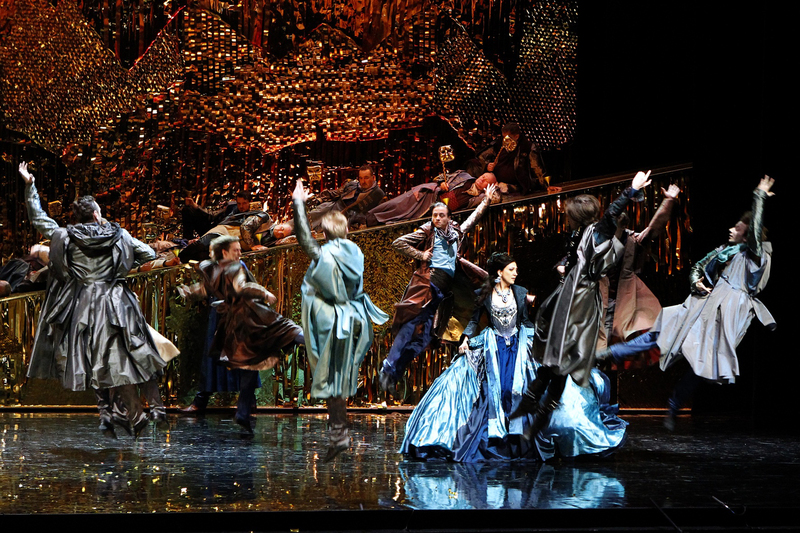 But Moskalewicz devotes the great majority of her text to an analysis of the national mythologies that underpin the project; for example, the national identity role that the 1858 opera – stylistically retardataire even at its arrival – has persisted in playing for so many decades. Traditional presentation of the opera Halka, composed by Stanisław Moniuszko to a libretto written by Włodzimierz Wolski. First performed in 1848. I don’t know why Moskalewicz chose to address the project this way. Perhaps she felt that the project could represent itself. Inversely, maybe she felt that the project needed a historical backdrop in order to represent itself. In any case, her choice creates a kind of respectful space around the project. By sticking largely to questions of how histories play out in the national imagination of the present, she allows the work to take on its separate role as art. She neither inflates nor underestimates its political and cultural role. Ultimately, she makes a case for questioning “nation” in general, which is a way of looking at the larger picture of an exhibition based, as she points out, on the very idea of the nation. Halka/Haiti 18°48’05”N 72°23’01.” Detail taken from performance image. But why does the project itself succeed in traveling so well in such a condensed way through social media? There’s no question that being present in the space of the exhibition must have produced a different affective spectatorial experience of the work than reading about it and viewing images. But it’s unique when a work conveys the depth of its layered meanings through a several-sentence description and a few photos, unique when it can work at opposite scales without losing subtlety, and while still resonating and provoking thought. Some of it must have to do with the sharp contrasts that the parameters of the project create. The inclusion of indigeneous and non-indigenous participants, for example (the opera is sung by professional Polish opera singers). But even there, the issues involved are complex. Because some of the indigenous Haitian participants in the project are descendents of the Polish soldiers who are thought to have aligned themselves with the revolt of the colonial Haitian subjects in 1803. And the insertion into that contemporary context of an opera that has been popularly and stubbornly accorded the status of Polish national representation – when Polish “nationhood” has been so historically fraught in general, and with a narrative about class disparity, no less – foregrounds how troubled the notion of the nation is once the colonizer’s ships hit the water, or soldiers cross national land boundaries or, for that matter, once money travels along digital signals. Even the word itself, indigenous, is ambiguous. It doesn’t depend on a definitive temporality of origin. If we’re going to be subject to the dispersal of art by digital media, would that many other projects would travel this well. In this instance it’s especially important that the work travels well, because it’s discourse applies to so many contexts, while being intensely specific to one. In the “overture” to her essay, Moskalewicz sets the scene by describing the anxiety felt by the artists and production team at the start of the filming of the project, due to what looked like impending rain that would have ruined the scheduled performance and filming. I wonder whether filming the project through the chaos of rain wouldn’t have added a fortuitous dimension to the project, given its allusions to the traumas of imperial and colonial legacies – in Haiti, in Poland, and elsewhere. Because the performative event that is just history, not art, is usually subject to chaos. #C.T. Jasper and Joanna Malinowska.